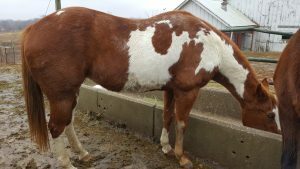 Classy is a 22 yr. old APHA Chestnut and white 15.3hh mare. She is very sweet and rides good at the walk and trot. She does good on trails. She is very kind to beginners but would do best with an intermediate or advanced rider.